In 1900, the American League was born at a Milwaukee hotel named the Republican House. 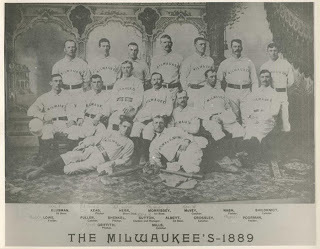 The following year, during the 1901 inaugural season for the American League, the Milwaukee Brewers were one of eight teams to participate in Major League Baseball's "Junior Circuit." The Brewers played their home games at Lloyd Street Grounds, which was located on the city's north side (Lloyd Street and 16th Street). Player/Manager Hugh Duffy hit .302 that season and was later inducted into the National Baseball Hall of Fame. Wid Conroy was the team captain. Bill Reidy led the pitching staff with 16 wins, and John Anderson paced the team with a .330 batting average. 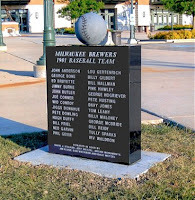 Five Wisconsin natives were members of that Brewers team, including Ed Bruyette of Manawa, Davy Jones of Cambria and George McBride of Milwaukee, all of whom made their Major League debut that year. Pitchers Pink Hawley of Beaver Dam and Pete Husting of Mayville also contributed. In 1902, the Brewers moved to St. Louis and became the Browns, but the league they helped form is still in existence today. After spending 52 years in St. Louis, the Browns moved to Baltimore in 1954 and became the Baltimore Orioles. Although usually implied to be a one-year team (almost invariably credited as "the 1901 Milwaukee Brewers"), they actually played eight seasons, beginning in 1984. That club, as with the AL itself, had its origins in the minor Western League. The Milwaukee club, seen here in its fifth year, was a founding member, along with teams in Detroit, Grand Rapids, Indianapolis, Kansas City, Minneapolis, Toledo and Sioux City. Note the player seated in the front row, left side. 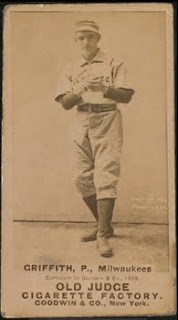 Clark Griffith was a right-handed screwball pitcher then with the Brewers, his first professional team. In 1891, he jumped to the major league American Association (not related to the 20th century minor league), and would go on to pitch for the St. Louis Browns (now the Cardinals), Boston Reds, Chicago Orphans (Cubs), Chicago White Sox, New York Highlanders (Yankees), Cincinnati Reds and Washington Senators. Griffith would find his true home in Washington, first as a player, then a manager, then as the team's owner from 1920 until his death in 1955. The Brewers would themselves move to the American Association for the latter part of 1891, after the Cincinnati Porkers dropped out of the league mid-season. Milwaukee stepped in to finish their schedule and amassed a 21-15 record, playing their home games in Borchert Field (then known as Athletic Park). Following that season, the American Association merged with the National League and the Brewers returned to the Western League, and the minors. Having had a taste of the majors, the Brewers would work their way back. The Western League, not content with being a minor circuit, would change its name to the American League in 1900, and the following season would declare itself a major. The AL would change the very nature of Organized Baseball, creating the two-league/World Series system we still enjoy today, but the Brewers wouldn't survive to see it. They moved to St. Louis before the 1902 season, taking on one of the hometown Cardinals' discarded nicknames (the Chicago entry would do the same thing, borrowing a bit of the older team's glory with the name "White Stockings"). As the Browns, the former Brewers set a standard for decades of mediocrity. The void left in Milwaukee by the departure of the American League club was filled by two new minor league teams. The first was the Milwaukee Creams, which played in a new incarnation of the Western League (confused yet? ), lasting only a few seasons before folding. The second took the by-now traditional name "Brewers." The Creams set up shop in the AL Brewers' former ballpark, Lloyd Street Grounds, forcing the Brews into Athletic Park, where they would be the most successful club Milwaukee had ever seen. Aside from a shared birthplace, the Browns had something of a link with the Brews throughout their respective histories. 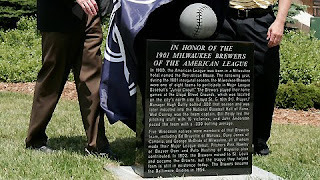 The Browns owned the Brewers from 1932-1935, notable in that it represents the only exception to the American Association club's independent status until the Boston Braves purchased the club in 1949. In addition, they had in common "The P.T. Barnum of Baseball," Bill Veeck, as owner. After cutting his eye teeth (and perfecting his gags) in Milwaukee, Veeck's showmanship would reach full bloom in St. Louis. The Browns themselves even flirted with moving back to Milwaukee on several occassions before the Braves claimed the baseball-crazy town for their own. They settled for Baltimore, where they still play today as the current incarnation of the Orioles. 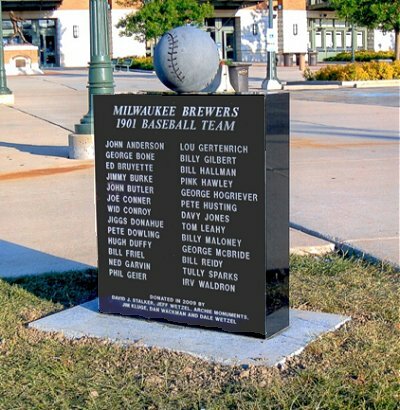 This recognition from the Brew Crew is a welcome addition to the public understanding of Milwaukee's rich baseball history, and a very classy move. The Braves so captured the public imagination that earlier clubs tend to be nudged out of the spotlight. The Brewers, to their credit, are working to change that.